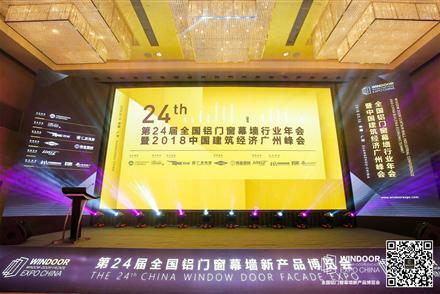 The annual Industrial Conference held by Aluminum Window Door and Curtain Wall Committee of China Construction Metal Structure Association will be held on March 10, 2018. Leading industry players from upstream and downstream will gather in Guangzhou to discuss industrial development strategy of year 2018. On the conference, a big shot will analyze the annual economy development of 2017, predicting the economic trend of China's 2018 building industry and investigate the road to transformation and development. Leading industry players from upstream and downstream will gather in Guangzhou to discuss industrial development strategy of year 2018. On the conference, a big shot will analyze the annual economy development of 2017, predicting the economic trend of China's 2018 building industry and investigate the road to transformation and development. 2017 was the year for the reform and development of the construction industry. The State Council of China issued the top-level design documents for the construction industry. The Construction Law, which was put in place in 1998, was revised. In year 2018, what is the new policy guideline of the Ministry of Housing and Urban-Rural Development on the construction industry? How the status of aluminum door and windows curtain wall industry will be? How to develop in the comprehensive reform of supply side? Under the guidance of the concept of new economic development based the thoughts of The 19th Communist Party of China National Congress, what the characteristics of the construction of economic development will be? How to interpret the new situation? How to explore new ideas for the development of the industry to find a new round of economic growth? Well-known financial and economic observer, Mr. Qin Shuo will analyze deeply the construction economy development and real estate trends for you! Leading experts in door and window curtain wall industry, well-known financial experts, real estate purchasing responsible persons and architects will come together to network and exchange ideas at this grand industry event.